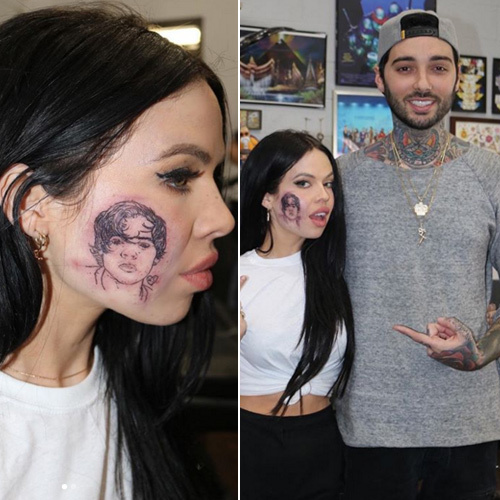 Singer Kelsy Karter has got Harry Styles's face tattooed on her cheek as his birthday surprise. Karter has had Harry Styles' face tattooed on her cheek after previously saying she is desperate to record a song on his next album. The inking was done by Los Angeles-based tattoo artist Romeo Lacoste and the New Zealand born, Los Angeles-based singer, 24, shared the results on Instagram, writing: "Mama, look what I made me do." The singer, who has written a song for Zayn Malik, 26, had hinted on Twitter earlier this month that she was planning to do something for 24-year-old Styles' birthday, which falls on February 1. She wrote: "Finally know what I'm getting Harry for his birthday.....". The singer also recently tweeted: "It's 2019 and Harry Styles is still the best looking human." It is not known if the two artistes are friends or if they have even met. But she had said last July why she loves him so much.